If you like your information visual (and who doesn't) and straight to the point with no fluff, then Pinterest will appeal to you. Women .. it has to be said, are Pinterest's current main demographic, however it may just be that women are pioneers in this instance and men will eventually catch up as can be seen in the UK where male user numbers are SLIGHTLY in the lead. 200,000 unique visitors use Pinterest daily ... and growing rapidly. SUMMARY : In my opinion and getting fairly gender specific, a percentage of the male UK activity could be marketing people who realise the potential of Pinterest and are early global and national adoptees. Younger people are not that interested yet. (cell phone related?) over 60s haven't found out yet or cant be bothered with it. Click to see a bigger view in a new window. Why should I be interested in Pinterest ..? While social media companies went to the wall in 2011, Pinterests users burgeoned. There are currently 4 million active users on their network and the company say this is growing rapidly. Google say they estimate minimum traffic through the site at between 1.5 million UNIQUE visitors daily and they spend an average of 15 minutes each on the site! Some figures estimate up to 13 million people on a good day hit the site. Pinterest.com therefore reaches almost 1% of all internet users (male and female). How do I join in ..? You sign up and wait for an invitation from Pinterest.com - there's currently a queue. (see side panel above). If you ask a member to be invited its quicker. When you are invited register using the same (business) email address you use for Twitter as this will link Pinterest to Twitter. You currently cant link Pinterest to a BUSINESS facebook account; only your personal account. 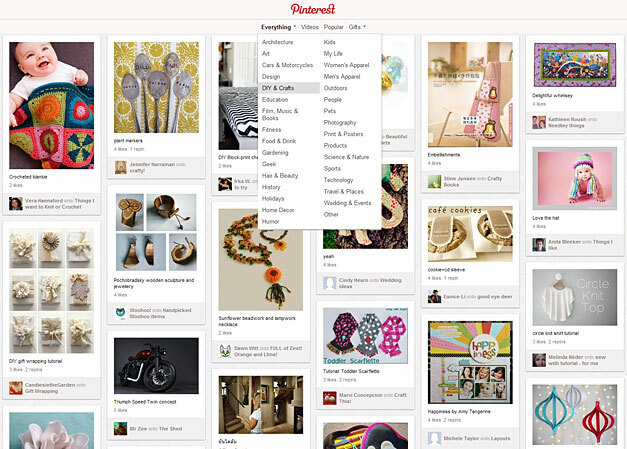 Optimise your Pinterest account under the SETTINGS menu. How do I pin stuff ..? B. Upload an image or video from your hard drive or give Pinterest the URL of an image. Pinterest is quite frank about SELF-PROMOTION - they don't like it and worry about it spoiling the "fun". However if you present your company as interesting and associate a LIFESTYLE - you can use creative imagery that no one will complain about. Think Lifestyle, Humour, Beauty, How To. There are exceptions Brides in Bridal gowns never seem to be out of fashion on Pinterest, even with blatant URLs tossed across the bottom of the image! Pinterest also supports hashtags so use them and make your pins (posts) easier to find. Using the same hashtag for Twitter, Google and Pinterest will be the foundation of a great cross channel campaign. You need to build a fan base. DO this by setting up themed boards (or just A theme board*). Members can then choose one of TWO options : follow YOU or follow the BOARD. To get people to follow you (and spread the love to their friends) Use the Pinterest Button on your website and Blog. ALso shamelessly promote through your Facebook, Linked In and Twitter accounts, anywhere in fact you are given the chance. *Each board concentrates on one set of KEYWORDS unless the subjects/keywords are related. Take photos and lots of them. Pinterest is a visual medium and there is near neighbour competition for viewer attention. Looooong pictures seem to be the vogue at present, however there is no guarantee how long this will last. Beauty in an image works well, as do photos that spark imagination and interest. Graphics that convey an instant message are good. Strong Visuals is a good key phrase to convey what's required. You may even wish to enrole the skills of fellow (trusted) Pinterest pinners by inviting them to pin on your board, thus increasing the diversity and thus appeal of your content. Showing happy customers in creative poses also garners interest. Voting is possible, so why not hold a poll on what visitors think. Behind the scenes and event videos & pictures are usually popular if what you do is interesting to other people. "Doing well on Pinterest is about finding how well your products and services fit the lifestyles of the Pinterest audience." Google Analytics can tell you via the REFERRER where a hit on your website came from. Those coming from Pinterest will also reveal which images work and which dont work so well. 4 - Design and pro-actively add content consistantly to Pinterest to maintain visitor interest. 5 - Measure the effectiveness of your campaigns via GoogleAnalytics or similar. Copyright law on images and brand is fairly well established. However its generally accepted on social networks, that so long as a user isn't trying to PROFIT by use of a copyright holder's image, clip or logo, then YOUR product benefits by exposure to a large social community. We would add that with most companies, their intellectual property and brands in particular are carefully guarded, so you MUST seek permission and give the context in which you hope to use a brand, image or video. Blog - An on-line diary you update on a regular basis i.e. A frequent, date-based weB-LOG of your thoughts, pictures & links. Hashtag - #calco and #seo and #SEM are all hashtags. They are used by Twitter, Google and Pinterest as keyword anchors. 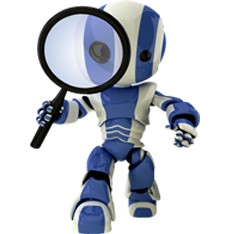 Calco understands that SEM is complex and diverse to the novice, however if you only want SEM applied to your website - call us on 01599 534964 and we will just do it for you. Pricing from 149 pounds + graphic design for Pinterest. Sadly at the current time you need to be invited to join Pinterest. Go to Pinterest.com Click the big button called Request an Invite. You will receive an email confirming your request and some time later an offer to join. Note that Pinterest comes up in SPAM a lot of the time so its a good idea to Whitelist their domain name (all email from pinterest.com) - at least until you are signed up. pinterest.com is full of large graphical charts called InfoGraphics. The idea is to convey a lot of information in graphs and tables so that the whole concept is easily digestible at a glance and closer inspection reveals data..